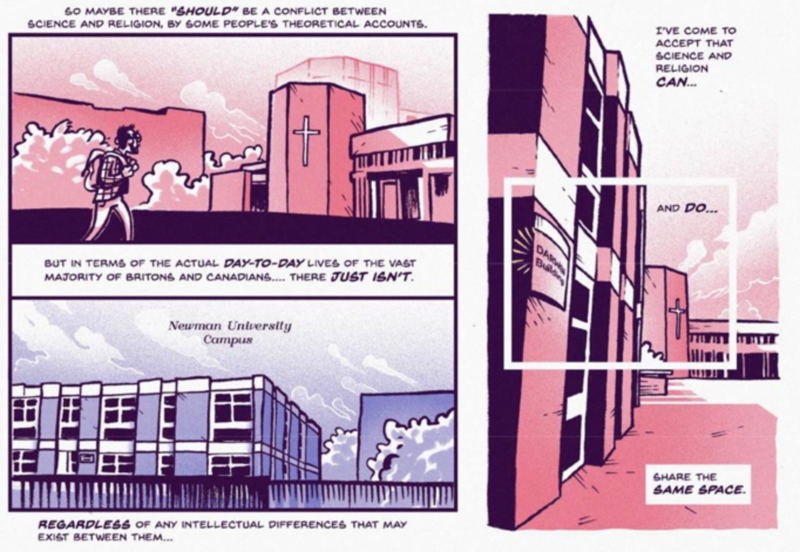 The comic highlights a new venture, Science and Religion: Exploring the Spectrum (SRES), which is sponsored by the Templeton Religious Trust, Newman University, The University of Kent, and, God help us, both the British Library and the British Science Association. Why the latter two organizations are engaged in theology, especially in a country far less religious than the U.S., is beyond me, but British scientists should raise some objections. As you might expect from the Templeton participation, the answer to the question is “no,” but they’re limiting the “problem” to the UK and Canada, where far fewer people have a problem with evolution than they do in the U.S. Nevertheless, there are Canadian and British creationists. The comic is dull and pendantic, but does highlight some useful points. First, as we’re increasingly realizing, acceptance or denial of evolution is largely a matter not of accepting or adjudicating facts, but flaunting your membership in a tribe: religious people and conservatives who reject evolution, and liberals who accept it. This is true in the U.S., too: on a questionnaire about science literacy in America, the National Science Foundation originally had a question about evolution, but discovered that it didn’t correlate with knowing truths about other areas of science, but rather was highly correlated with religiosity. In other words, the “do you accept the truth of evolution” question was a marker not of scientific literacy, but of religiosity. The question, adding nothing to the survey’s results, was dropped. Further, the cartoon makes the obvious point that if you push evolution at the same time you call religious people “morons”, or insult them directly, you’re not going to be very effective. 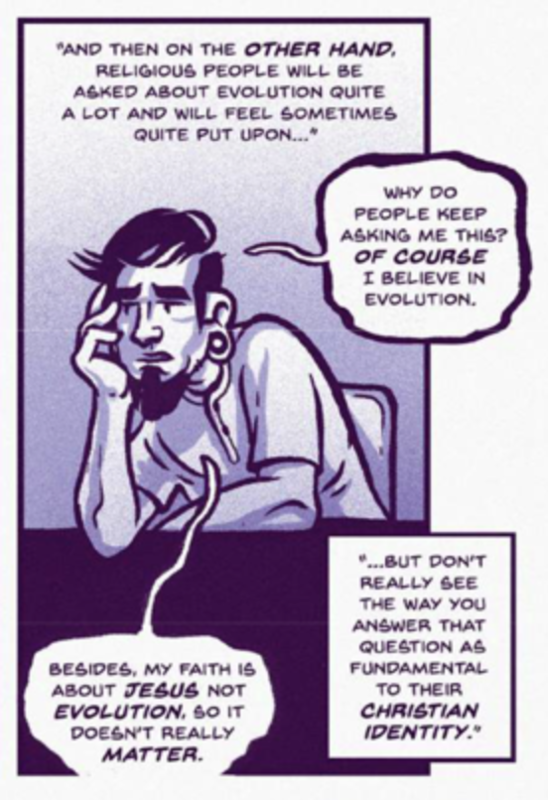 On the other hand, the cartoon is wrong in asserting that one can be consistently religious and accept evolution. That’s because the inconsistency becomes plain when both religion and science make truth claims, as they both do; but we see that only science has a way to examine and test those claims. In other words, the incompatibility of science and religion, the thesis of my book Faith versus Fact, is an incompatibility in how we evaluate truth claims. And believe me, virtually every religion makes truth claims, most starting with the existence of a theistic God. 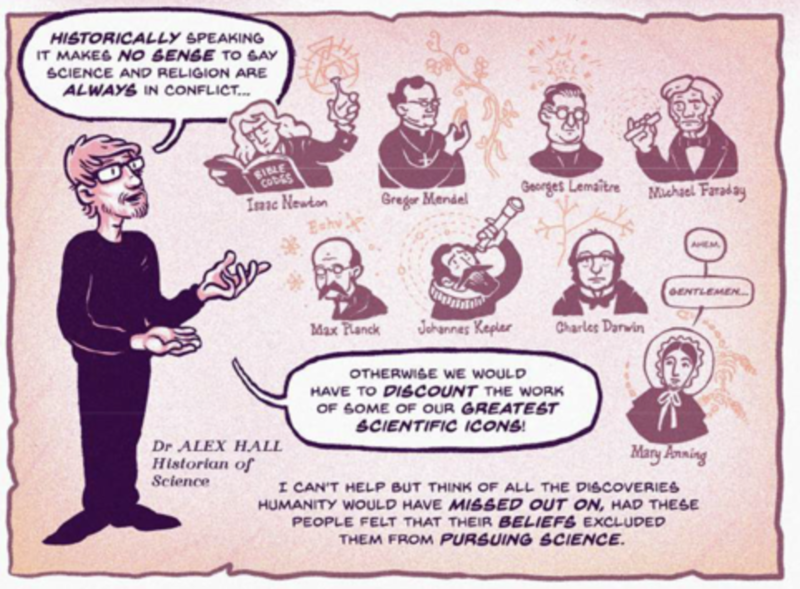 Of course, the cartoon doesn’t examine this incompatibility, but just trots out the old canards of showing “compatibility” because many scientists were Christians, that many laypeople accept evolution and religion at the same time, and so on. It doesn’t attack the fundamental weakness of relying on faith rather than empiricism to discover what’s true. Here are a few panels from the cartoon. I’ve made a Word document with the whole thing in it, which you can obtain with judicious inquiry. Have a gander at this lame attempt at showing the compatibility of science and religion. It implies that Charles Darwin was religious, when in reality he became increasingly atheistic as he aged. As for those who lived before Darwin, well, everyone was a creationist then, since it was the only game in town. Does that mean religion is compatible with everything that happened before 1859? There’s a lot more pablum in this jar, so ask if you want to see the whole damn thing, or just read the cartoon on the website. I guarantee that you won’t be enlightened. This is par for the course for Templeton, but it’s horrifying to think that this project is sponsored by both the British Library and the British Science Association. And I ask again: why are people so interested in whether science and religion are compatible rather than, say, whether business and religion are compatible, or sports and religion? Could it be that there has been a conflict between the first two areas and not the last? And if that’s where the interest lies, why? I think it has something to do with the fact that science has the ability to test claims about the universe, and has repeatedly disproven the claims of religion—starting with Genesis I and II— but religion has no reciprocal ability. Science doesn’t need religion to see whether its hypotheses are true. This entry was written by whyevolutionistrue and posted on July 23, 2018 at 10:30 am and filed under Accommodationism. Bookmark the permalink. Follow any comments here with the RSS feed for this post. Both comments and trackbacks are currently closed. Thanks for that. All too true. Blasphemy! — that cartoon of the apes and the monolith, I mean, a traducement upon the good name of Stanley Kubrick. I think religion will always have to go after science and be preoccupied with finding standing with science. It is first a very big insecurity problem for religious people and they also know that science is their enemy. It is closing in on their beliefs and it must be attacked. It is in their nature to do this and always has been. Before science all they could attack was any other religion and they did a pretty good job of that. In war, to be successful you must understand the enemy and science is the enemy. It is the same thing with atheist. It is enemy and must be attacked. That *is* a step above a Chick Tract, but not a very big step. The extra-terrestrial/creationist comparison, for example, uses the phrase “moral panic”. This demonstrates just gut-level dishonesty at two levels. First, the “panic” is not moral (except, I suppose, in the sense that any desire for truth is a moral issue), it is largely driven by the reality that creationism is the most public face of a generalized scientific illiteracy. An illiteracy that informs public policy, and therefore becomes of general concern. Secondly, UFOlogy is not religion, and there is not a concerted effort to teach it as science in secular schools. Creationists come to my attention because they have an organized campaign to push their religion into science classrooms. If UFOlogy occupied the same space in culture that creationism does, it would cause the same response. I think it’s at least a few steps above Chick Tracts. Some of those things are vile enough to lose one’s breakfast over. Well, how nice of them to introduce us to the God of the Gaps. And it’s extra spiffy that they’re actually admitting that this conundrum is specifically a scientific issue. Given that neuroscience is making leaps and bounds, I wouldn’t put any money on how long it will “endure.” Assuming the answer isn’t already to be had. Yes. Religion has only dogmatic answers* to old questions and no way to discover new ones. Begging the question and other forms of circular reasonnings involving magical entities like gods and souls are rhetorical tales, not testable hypotheses. I cannot see what religion (Christianity in this case) can bring to the scientific study of consciousness. * which, in substance, are on the line of “don’t ask, it’s tradition”. The soft problem of mechanism may be scientific; I am not convinced there is a “hard” problem of “human experience”. Say, shared pain response in animals is a simple enough result of a mechanism. But as an analogy, most proteins fold chemically after translation from mRNA. We don’t know the exact mechanisms that allow this, but no one conjured up a religious gap here I think. And there has been progress [ https://www.ncbi.nlm.nih.gov/pmc/articles/PMC2443096/ ]: “And, there is now a testable explanation for how a protein can fold so quickly …”. How is explaining this different from explaining animal responses? Jerry has mentioned this problem, but I don’t see its allure. I have indeed come to think of this philosophy nugget as a – unsupportable – gap suggestion. It appears that the cartoonist still has some evolving to do. It seems to me that at some point we have to distinguish between religion and a belief in (for lack of a better word) “God.” A religion is a man-made institution, like a government, and is therefore almost by definition corrupt. A personal belief in God may be the result of religious propaganda or brow-beating, but it might also be the result of one’s subjective experience of the universe. You acknowledged yesterday in “A Thought” that “subjectivity is part of our emotional connection with others.” And indeed it is part as well of our connection with animals, trees, all of nature. 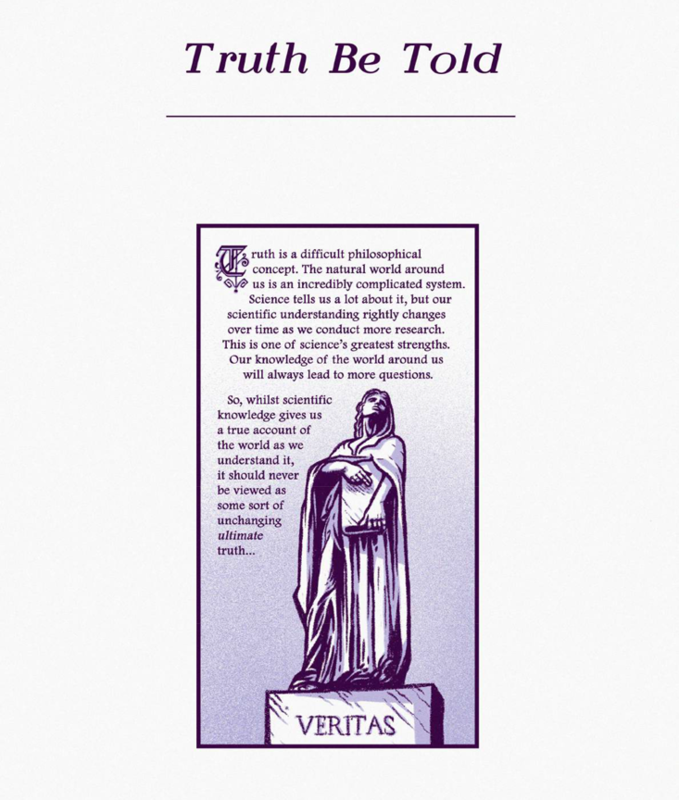 We make truth claims based on those connections—e.g., “Grania is a person of great integrity” or “Ducks are worthy of our attention and protection”—and place high degrees of certainty on such claims even though they cannot test them scientifically or empirically. The same applies, seems to me, to one’s experiential truth claims about “the existence of theistic God.” The fact that organized religions also make this truth claim (and then proceed to build all sorts of sadistic rules based on it) doesn’t automatically mean that the claim is wrong. You are mixing truth claims with subjective, untestable claims about taste, like “Ducks are worthy of our attention.” And you can test claims about peoples’ characters empirically. Those are far, far less “subjective” than claims that a loving omnipotent God exists, which has been tested and falsified. The claims about God aren’t automatically wrong; there’s just no evidence for them, but we do have evidence for Grania’s integrity. Respectfully, I seriously doubt that, if someone started throwing stones at Honey and her brood you would write it off as simply a difference of taste. You don’t just have a belief or an opinion that this would be wrong; you know it would be wrong. Similarly, while Grania’s integrity may be empirically testable, the test results are not how you know the claim to be true. My point is that these things are not matters of faith based on revelation or authority as, say, a belief in the Resurrection necessarily is, but of knowledge based on subjective experiential evidence. Such evidence is not infallible any more than scientific evidence is infallible, but it forms the basis of some of our most strongly held convictions. Unfortunately, it doesn’t form the basis of consensus except among people whose experience is similar. So in that regard you may be right: there’s no more point in debating it than there is in debating matters of taste. I’m reminded that the word “mystery” comes from a Greek word that means “Close your mouth.” I close my mouth. There are people who think it’s fine throw stones at ducks. In fact, I’ve seen it done. I would say it’s wrong, but some would disagree. There is a consensus, but no objective truth. How about “It’s wrong to have an abortion?” Is that an objective moral truth based on “subjective experiential evidence? The statement was “Ducks are worthy of our attention” anyway. I can’t believe you think that’s an objective statement. But I’ll rely on your promise to keep silence. This is a pet peeve of mine: The set “religion” is not exhausted by the set “Christian”. There are numerous other religions out there, many of which don’t seem to have any trouble with the idea of evolution. In fact, many sects of Christianity don’t have any trouble with the concept. If they accept evolution, it is only if guided by divine forces. And generally they make a special exemption for mankind. No Christian can really accept evolution because it disproves the possibility of the Genesis story, of original sin, and the need for a savior. Look at the knots scientists like Francis Collins and Ken Miller tie themselves into trying to square that circle. And your evidence for this is…..? Have you discussed this with the aboriginal Australians? Folks practicing traditional Japanese religions? Chinese? African? How many Wiccans have you discussed this with? Even your statement demonstrates the narrow focus that I’m arguing against. The concept of divinity isn’t actually universal in religion. Ancestor-worship, for example, doesn’t necessarily imply that the ancestors are divine, merely that they are supernatural. The problem with focusing on one group of religions is that it gives theists a very easy out. They can point to the fact that this is very sloppy research, violating our own principles of inquiry, and we end up looking like a bunch of morons. Since we can’t even follow our own standards, ALL of our arguments will be perceived as suspect. This isn’t theory; this is what I’ve experienced in observing a number of debates on this topic. I always find this sort of statement amusing. It assumes that the people outside the religion get to tell those inside the religion what they are or are not allowed to do. This sort of statement violates the foundational assumption of argument: That each side gets to present its own side of the debate. You can point out contradictions, you can point out inconsistencies in logic, you can point out fallacies–but you CANNOT state what the other side is allowed to (or not) believe. Many Christians have no problem accepting the truth of evolution. So your statement is factually wrong. They can and do. Whether it’s consistent or not is another matter entirely–and it’s important that we understand what they actually think, rather than what we think they should think. This is a basic concept in studying any system from a scientific perspective. Pores are on the ridges of fingerprints; what we think should be true, often isn’t so. We should not abandon the principles of scientific inquiry merely because our opponents often do so! This may shock & amaze you but most atheists used to be in some religion and in the US that was generally some form of Christianity. Now the basis of Christian dogma is that Jesus had to be born & die because a man made from dirt & a woman made from a rib listened to the advice of a talking snake and ate a magic apple they weren’t supposed to. If that dogma is wrong then none pof the Abrahamic religions has a reason to exist. Hint, its’ wrong. if Abrahamists were honest they’d admit their eeligion is a lie and give it up but thanks to the ‘miracle’ of mental compartmentalization they keep on believing even when they know they shouldn’t. A lot of Christians will tell you that the whole story of the Fall is symbolic, not factual. They might say that it is a metaphor for humanity’s attainment of the mental capacity to know the difference between good and evil and therefore be responsible for the evil things it does. At least that’s how this ex-Christian used to rationalise it. The set “science” is not exhausted by the set “evolution,” either. Nor is “evolution “ necessarily confined to its simplest understanding. When religions turn science on God, it usually results in either 1.) pseudoscience or 2.) the insistence that one cannot turn science on God. I wonder whether the surveys in the U.K. considered people from Northern Ireland. The Protestant churches there have close connections to the U.S. religious right. Northern Ireland is a hotbed of creationism, and intellectuals in Great Britain who attack evolutionary biology tend to come from there. Northern Ireland is indeed quite an outlier in Europe, and even more so when compared to the rest of the UK. I guess the conflict in Northern Ireland was probably the main reason that the nuttier beliefs of Christianity were better preserved there than in other parts of Europe where (religious) tribalism was less of an issue. BTW, if I remember correctly, Jerry has first hand experience with NI creationists. I love the cartoon guy’s shocked, shocked I tell you, of course he believes in evolution. Why, what would make anyone ever think he doesn’t? Shocked, shocked, I tell you. This spiffed up Chick Comic reminds me that accommodationism is, as someone said, like sitting on the wall to the asylum. Does a smoking doctor make tobacco harmless, or does a thieving cop make crime legal? As for “truth” it is literally not very complicated in the logic that sprung out of philosophy, it is just a boolean value. I assume they want to allude to facts and reality, which are fundamentally not very complicated concepts either. Coincidentally truth values and axiomatic logic systems are worthless to model facts, it has long been known that statistics and observations is the way to go. It is precisely because science and religion are not compatible that so many try to make them compatible. Templeton should look hard at their effects and assess who it is they are accomodating. Without evidence for fairies or angels or gods the secularist needs no accomodating. The faithful may or may not be swayed by arguments for compatibility. Religious people already believe in things that require no evidence. Stretching those beliefs to include arguments of accommodation, which also have no evidence, is not an accomplishment. Wow, speaking of things for which there is no evidence, our great leader has just announced that several former top intelligence professionals should have their security clearances removed. The reasoning for this statement is that these people have all made statements about him that he does not like. This is a watershed moment in this administration and pretty good evidence of the mental condition of this person. It could also be a direct contradiction to free speech. This sort of stuff is pernicious. The narrators say that they “accept evolution” (wow, thanks! ), but they never explain to their goddy audience what that actually entails. And it doesn’t mean providing an orifice into which a deity can be inserted. And their introduction of the so-called hard problem is disgraceful. It amounts to the old assertion that “this is a mystery: therefore Godditit”. The scientist’s answer ought to be “this may be a mystery; but we’re working on it”. I am shocked that the BSA has allowed itself to be associated with such apologetics. Thanks for the post PCC(e). 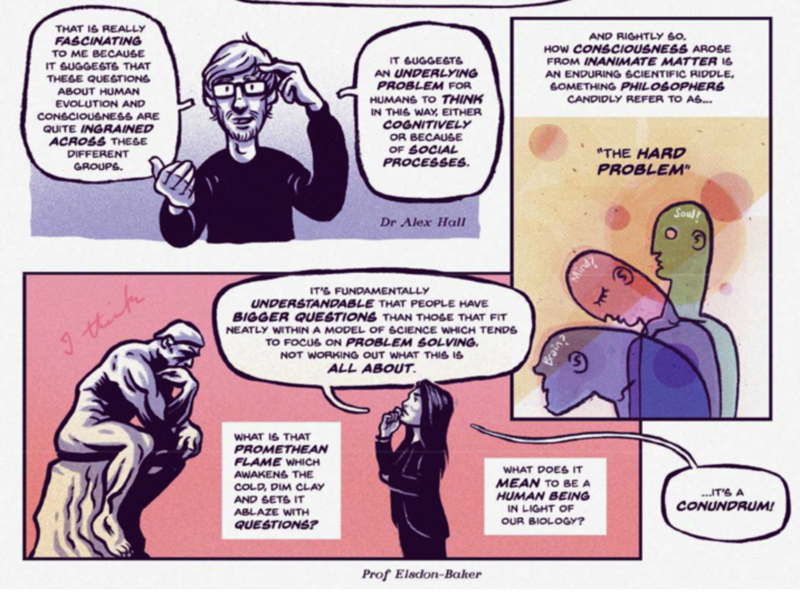 I will use this comic in my Evolution class to discuss critical thinking with my students. In skimming this, I don’t see anything about science being based on facts (yes, evolution is no longer “just a theory”) and religion being based on beliefs. I think someone said, “the great thing about science is that you don’t have to believe in it for it to be true.” Which leads to the different definitions of truth: truth can be defined by facts, or by belief systems. Be sure which a person means when they talk about ‘truth.” I know that evolution is true because it has been scientifically proven. I believe the message of the Scripture to be true in the spiritual sense. For people who deny the existence of God because they can’t prove it, there is no conflict. For those who claim to take the whole Scripture literally (no one really does), there is no conflict. What makes me uncomfortable is people who try to “Prove” the Scripture through scientific research – now there’s a conflict! And so it goes, TF monies to keep this travesty alive and delude. I must inform you that I have placed an official complaint with WordPress that We find these pictures offensive and we are asking wordpress to stop the distribution of your website in the Uk. Adding pictures to an essay does not a comic make. I found it tedious. TL;DR type tedious. Actually, even didactic ‘cartoons’ whose message I agree with, I find patronising and vaguely embarrassing. As if the audience can’t be expected to understand the message unless it’s dressed up for juveniles. I personally have no problem with catering to “visual learners”, where a comic or cartoon would be appropriate. But here (1) there is no content worth doing and (2) the pictures do not seem to actually illustrate the topic.